You might say I liked to drive fast. The year 2002 was something of a watershed year for my traffic record. As a play-by-play sports announcer for my college’s student radio station, I traveled a lot, operating under the mistaken impression that 20 miles per hour over the speed limit on the interstate was acceptable. It took four tickets that year – including two in one day – to lead me to ease up on the pedal. However, I still sped, just not as far over the limit. Then I had kids. Suddenly, getting to my destination in a hurry seemed a lot less important. I started driving the speed limit whenever the kids were in the car. Be flexible. Sometimes you have to go a little bit over the speed limit, to avoid bad situations, stay with the flow of traffic, etc. It’s about being peaceful, not obsessive compulsive. Don’t sit in the fast lane on the highway. I’ve heard of people who insist on driving in the left lane to prevent others from speeding, but all that does is enrage people. I like to get in the lane that I need to be in and stay there whenever possible. It’s just one less thing to worry about. 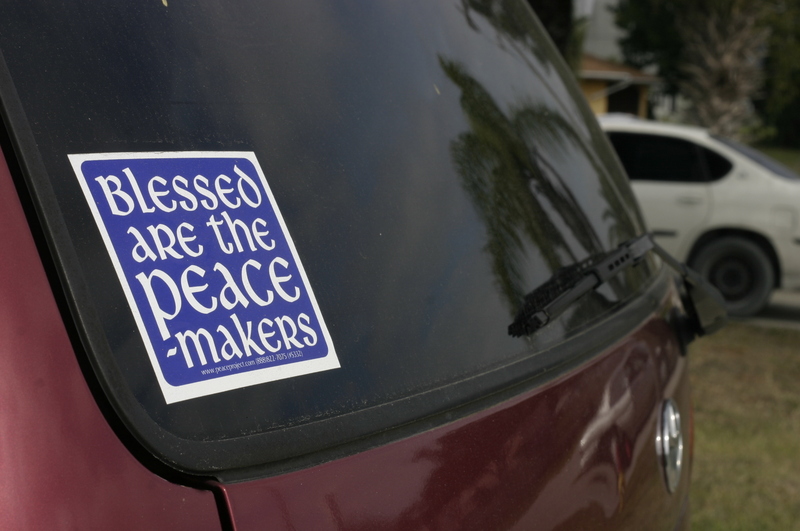 This entry was posted in Spirituality and tagged Beatitudes, Buddhism, Peace, Peter by Dave Montrose. Bookmark the permalink.